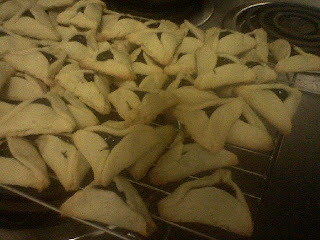 Baking and Mistaking: Happy Purim! 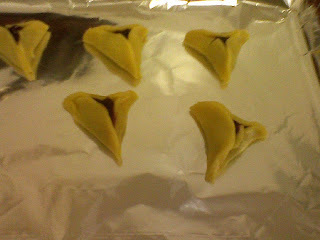 Yesterday was the Jewish holiday of Purim, which is celebrated with traditional triangular shaped cookies called Hamantaschen. The name refers to the three cornered hat thought to be worn by the villain of the Purim story, Haman. You can fill these with pretty much anything imaginable (I've seen some pretty inventive things) but if you couldn't tell by now, I love all things raspberry, so clearly thats where I went. I actually made this dough a couple days in advance, since it needs to be refridgerated for at least a few hours, and I had the time to quickly put it together then. So, the recipe called for a 2.5 inch cookie cutter, and I was rummaging through my kitchen trying to find something. I also didn't have a ruler, so I looked up online the size of a dollar bill, and lo and behold, the width is 2.6 inches. Perfect! And, guess what was just slightly smaller than a dollar bill...the lid to my Pam container. Desperation is the mother of innovation I guess, but the lid worked perfectly and the cookies came out great, light and sweet and delicious. 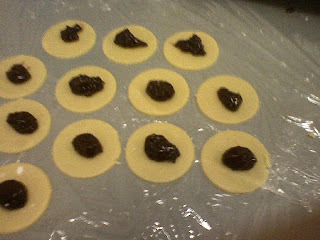 Here the are right before going in the oven - don't worry, I immediately ate the ones that weren't shaped well! Tip of the Day: If you're rolling out dough on a counter, cover the surface first with lots of wax paper or saran wrap (you can tape it down to keep it in place) for an easier clean up. Beat butter until creamy. Add in sugar and beat until light and fluffy. Add egg, egg yolk and vanilla and mix until well combined. Beat in flour, baking powder and salt gradually until well combined. Divide the dough in half and refridgerate for a few hours or overnight. Roll out dough until 1/8 inch thick, cut out 2.5 inch rounds and reserve trimmings to reroll. Place 1 tsp filling in the center of each round, and fold up two sides and pinch closed, then fold up the third. Bake at 375 for 12 minutes or until lightly browned. Cool for one minute on the baking sheet and then transfer to a wire rack to cool completely.